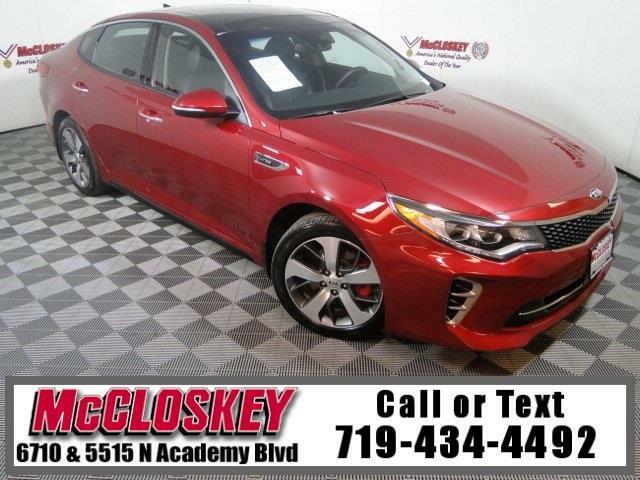 Low miles 2017 Kia Optima SX Turbo with Panoramic Moon Roof, Blind Spot Monitor, Lane Departure Warning, Premium Technology, Harmon Kardon Sound System, Heated and Cooled Memory Seats, and Backup Camera! For a sportier Optima, Kia offers the SX. It's powered by a turbocharged 2.0-liter four-cylinder engine (245 hp, 260 lb-ft of torque). It is equipped similarly to the EX, with upgrades that include 18-inch wheels, adaptive LED headlights, a rear spoiler, dual exhaust tips, a sport-tuned suspension, a flat-bottom steering wheel with wheel-mounted shift paddles, a larger driver information display, an auto-dimming rearview mirror, rear window sunshades and the 8-inch screen with navigation. This vehicle passed our 110 multi-point inspection and is backed by our National Quality Dealer of the Year Award. We are an ''A+'' Better Business Bureau Rated Business. We offer low interest rate financing, low down payments and the highest trade allowances in the state! Here at McCloskey we do things a bit differently, we shop our competition every day to ensure a great value to you. Come on down and experience it for yourself. This McCloskey Assured vehicle includes a 2 month/2000 mile Warranty and a Vehicle History Report!! At McCloskey we strive to provide ASSURANCE, TRUST, VALUE AND QUALITY! Call 719-434-4492.